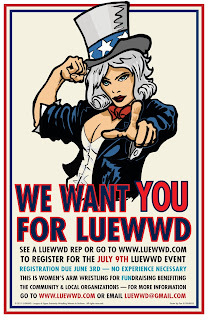 On Saturday, July 9th, 2011, the League of Upper Extremity Wrestling Women of Durham (LUEWWD) will host LUEWWD IV: A Call to Arms, their 4th event where costumed women arm wrestle to support local non-profits. For this tournament, all proceeds will be donated to Girls Rock NC, a non-profit organization that runs programs to encourage girls to be confident, creative members of their community through forming bands, writing songs and attending workshops about teamwork and body confidence. Contestants will compete in a single elimination arm-wrestling tournament to win the title of LUEWWD Champion. The contestants are also responsible for collecting “votes” (i.e. money) from the crowd with the help of a 4-person team (called an entourage), that is also dressed in a themed costume. Doors at 8pm, Event starts at 9pm.